#1 NEW YORK TIMES BESTSELLER • Alex Delaware and LAPD detective Milo Sturgis investigate the death of Alex’s most mysterious patient to date in the sensational new thriller from the master of suspense, #1 New York Times bestselling author Jonathan Kellerman. At nearly one hundred years old, Thalia Mars is a far cry from the patients that child psychologist Alex Delaware normally treats. But the charming, witty woman convinces Alex to meet with her in a suite at the Aventura, a luxury hotel with a checkered history. What Thalia wants from Alex are answers to unsettling questions—about guilt, patterns of criminal behavior, victim selection. When Alex asks the reason for her morbid fascination, Thalia promises to tell all during their next session. But when he shows up the following morning, he is met with silence: Thalia is dead in her room. When questions arise about how Thalia perished, Alex and homicide detective Milo Sturgis must peel back the layers of a fascinating but elusive woman’s life and embark on one of the most baffling investigations either of them has ever experienced. For Thalia Mars is a victim like no other, an enigma who harbored nearly a century of secrets and whose life and death draw those around her into a vortex of violence. 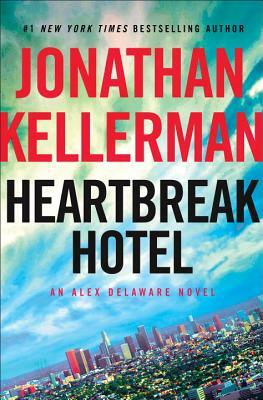 Heartbreak Hotel is classic Delaware and classic Kellerman. Jonathan Kellerman is the #1 New York Times bestselling author of forty-one crime novels, including the Alex Delaware series, The Butcher’s Theater, Billy Straight, The Conspiracy Club, Twisted, True Detectives, and The Murderer’s Daughter. With his wife, bestselling novelist Faye Kellerman, he co-authored Double Homicide and Capital Crimes. With his son, bestselling novelist Jesse Kellerman, he co-authored The Golem of Hollywood and The Golem of Paris. He is also the author of two children’s books and numerous nonfiction works, including Savage Spawn: Reflections on Violent Children and With Strings Attached: The Art and Beauty of Vintage Guitars. He has won the Goldwyn, Edgar, and Anthony awards and has been nominated for a Shamus Award. Jonathan and Faye Kellerman live in California, New Mexico, and New York.